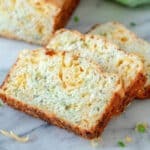 This Zucchini Cheesy Quick Bread couldn’t be any easier! This savory bread is perfect for sandwiches! Especially grilled cheese!! I skipped a step by using Bisquick, (or your favorite baking mix) instead of mixing all the dry ingredients together. If you are a follower of this little blog of mine, you know that I am crazy about quick breads. You can incorporate just about any fresh or frozen ingredient that you are trying to get rid of. 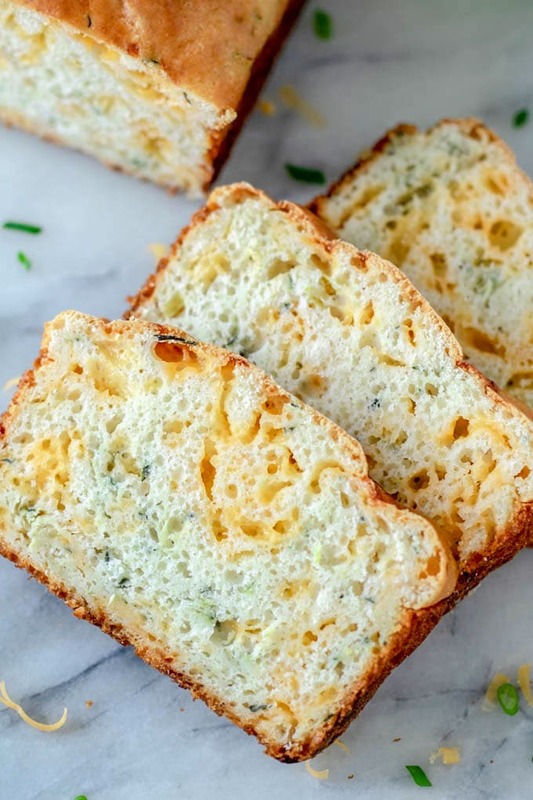 If you have a bundle of parsley or thyme or rosemary in your refrigerator that you have to use up quickly, throw it in a savory quick bread and serve it as a side for just about any meal. What Cheese is Best to Use in Cheese Bread? 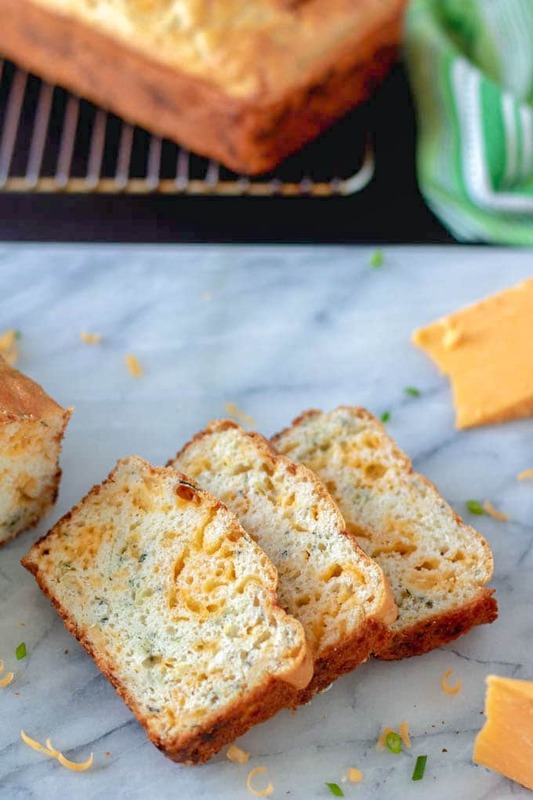 Can You Substitute Other Vegetables in This Cheesy Quick Bread? Can You Freeze Cheese Bread? You can use either fresh or frozen, thawed zucchini. If you use fresh zucchini, use 2 cups shredded zucchini. If you use frozen, thawed zucchini, use approximately 4 cups (amount before freezing) of grated zucchini. When using frozen ingredients, make sure you thaw them completely and drain the excess water very well or your bread will fall. In the case of the zucchini, I grate them when fresh in the summer and place in food storage bags. If you use this method, you really should wring the excess water out by squeezing in you hands because they store large amounts of water that will ruin your bread. Truly, any semi hard cheese can be used in cheese bread. In this case, I used a sharp cheddar. Other cheeses that would be equally delicious include, gouda, swiss, colby, muenster or gruyere, amoung others! Hard cheeses, such as Parmesan, Romano or Asiago could also be used for a different flavor profile! Every different cheese would result in a totally unique bread so the possibilities are literally endless. Absolutely, you can substitute other vegetables in the quick bread. 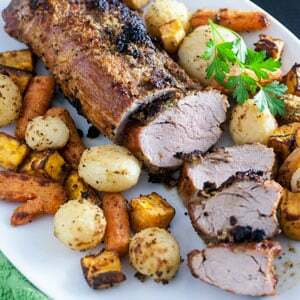 Use grated carrot or parsnip, instead of the zucchini. Substitute dill, parsley, rosemary or basil for the green onion. Just like the cheese, every different addition will give you another flavor profile! The possibiliies, are, once again, endless! Yes, you can freeze this cheese bread for at least 3 months. Drain zucchini, if using frozen. Break eggs into small bowl. Whisk. Measure milk or buttermilk. Substitute milk with lemon juice or vinegar added to make buttermilk. Add zucchini, cheese and green onions. Pour batter in 2 9″X 5″ bread pans. Fill 2/3 full. Bake at 350°F for 45 minutes to 1 hour, until tester comes out clean in the middle. Cheese Bread can be stored in a paper bag on the counter for 2-3 days, in the refrigerator for about 5 days, or wrapped in freezer paper and frozen for up to 3 months. This bread is great toasted with butter but also makes a killer grilled cheese sandwich! Grease 2 - 9" x 5" loaf pans.. Mix eggs and buttermilk in mixer bowl and beat until combined. Add zucchini, cheese and scallions and just mix through. Bake 1- 1 1/4 hours until tester inserted in middle comes out clean. Cool thoroughly on wire rack. That’s a great way to use up leftover herbs and your quickbread sounds lovely. 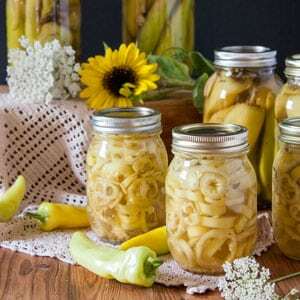 It really is a great way to use up what you have in the refrigerator or garden! Thanks for comment Lucy! I’ve never made a savory zucchini bread but it sounds delicious. Love the onion addition and it would go great with a hearty pasta dish! I love green onions in just about anything! They add so much flavor! Thanks Karen! I love all breads, quick and not so quick! 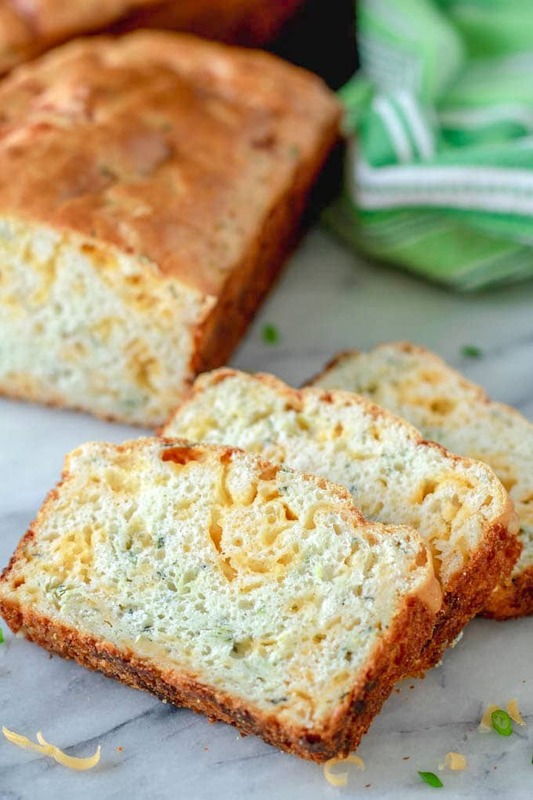 This savory bread sounds scrumptious and I can’t wait to make it! 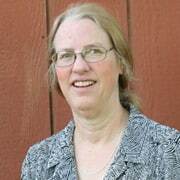 Thank you Elaine! I agree with you! I could honestly eat bread at every meal! I need to get into quick breads. This looks incredible! 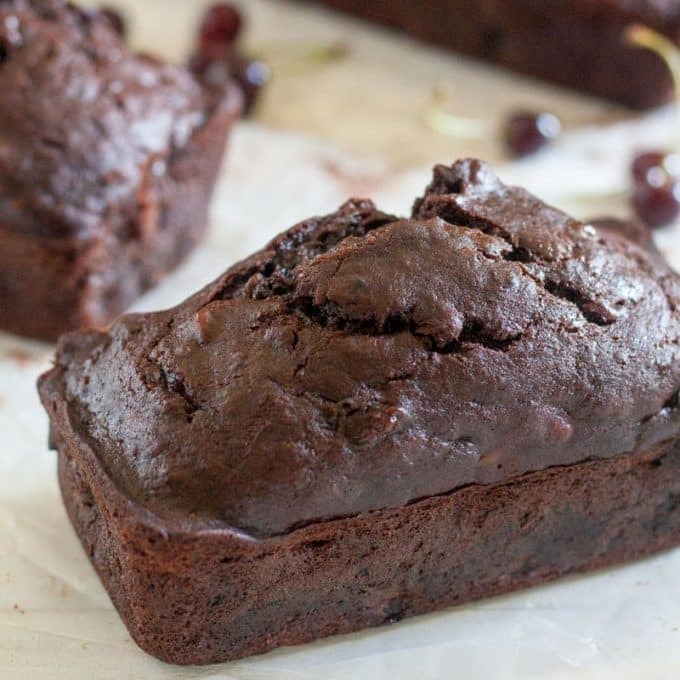 Quick Breads are one of my favorite! They are so easy and delicious! Thanks Brandi! This is a beautifully done departure to the usual zucchini bread. Saving this for the summer garden overload! Thank you Dan! It is really super tasty and moist! Thank you Raia! It was super good! I love how zucchini is so versatile! This bread looks so goood! I love using zucchini in a variety of dishes! Bread, kind of tops the list, I think! Thanks Liz! Looks super super quick and very tasty. Not sure we get that mix here though. You’re favorite baking mix will work. You can also use a scratch quick bread recipe and just add a bit of sugar, instead of a the amount you would use for a sweet bread. 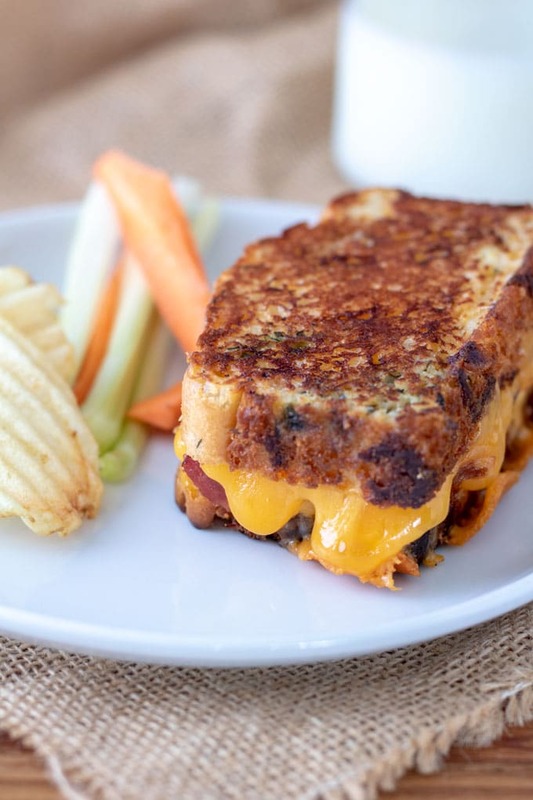 That grilled cheese bread slice is calling my name. Delicious I never thought combining zucchini and green onion will be okay. But you proved I am wrong it makes delicious bread. It really made a fantastic grilled cheese! Thank you for your comment, Swathi! I love a savory quick bread. The flavors here sound great! Thank you Mary! I appreciate your comment! It is really very tasty! I have never thought of using any kind of zuchinni bread for grilled cheese. This is genius! It was so very good! Looking at it makes me want to make another batch! This savoury zucchini quick bread sounds so good. Turning it into grilled cheese is inspired! What a great idea! I was already in love with the idea of this more savory bread recipe and then I saw how versatile it is with all of the ways you used it. I am going to have to try this ASAP as this looks amazing! Luci’s Morsels | fashion. food. frivolity. Thanks Luci! I don’t think you will be disappointed! Yum. There is nothing better than a wonderful savory bread. I agree, Hannah! The smell in the kitchen when it’s baking is the best, isn’t it! 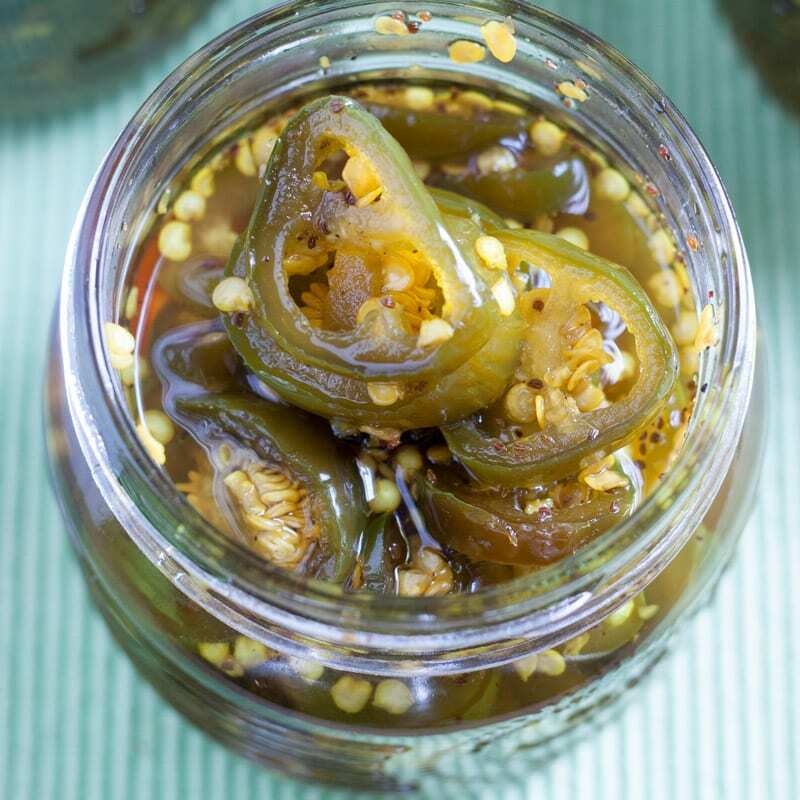 This sound like a delicious combination for a bread with zucchini, onions, and cheese. Yum! It really was super tasty! Thanks, Stephanie! This looks so good, I love the idea of using zucchini in bread, and cheese and onions too – yum! Thank you Hope! We really enjoyed the grilled cheese I made with it also! Nice recipe. Have made zucchini bread before but Like your idea of adding scallions to the mix. Nice touch. Thank you cookilicious! It was very tasty! The savory aspect was so different! I’m a big fan of quick breads too and I love to mix “stuff” in to make it more interesting. Zucchini and scallions are a great mix in — but the cheese sets it apart. I love the grilled ham and cheese you made with it too! Thanks, Lisa! It’s been so long since I made this, I forgot about it! I’ll have to make it again! It was sooo good! Beth, you and I think alike because I’m all about using whatever is lurking in the crisper drawer in whatever it is I’m making… This quick bread looks like a perfect thing to go with a bowl of soup or salad (and glass of wine)! Yes, I hate it when I miss something and have to throw it away! And naturally, re: the glas of wine! Thanks so much for stopping by Lisa! I’ve never made a savoury quick bread but this looks delicious. Love the combo of zucchini and cheese. Yum Yum! It really is very good! With soup or a salad, or used for sandwiches! Thank you Jacqueline!